Water-resistant make-up has finally met its match. Germaine de Capuccini Bi-Phase Make-Up Removal Lotion is a gentle tonic that lifts make-up from the eyes and lips with ease. This dual phase lotion contains an oil-based formula (the upper section) that harnesses the power of essential oils to remove water-resistant make-up. The lower section, the second phase, is a water based emollient that cleanses the skin and leaves it in perfect order. Dermatologically tested. Fragrance-free, paraben-free and suitable for those who wear contact lenses. Aqua (Water), Cyclopentasiloxane, Isohexadecane, Sodium Chloride, Pentylene Glycol, Lauryl Glucoside, Dicaprylyl Ether, Benzyl Alcohol, Dehydroacetic Acid, Triethanolamine, CI 60725 (Violet 2), CI 60730 (Ext. Violet 2). 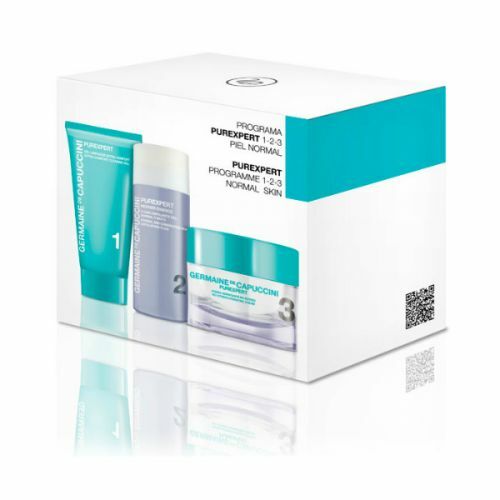 Use Germaine de Capuccini Bi-Phase Make-Up Removal Lotion with a cotton pad. The upper phase is to remove oil-based make-up and the lower for lighter cream and powder based formulas. Apply to a cotton pad and gently wipe over the face. Always store it at room temperature. Gentle warm the cotton pad in your hands before applying the lotion, this will stop the pores from closing and trapping the make-up. No scrubbing required! This eye make up remover lotion needs a good shake to mix and apply to a damp cotton pad , hold in place over your eye and it does all the hard work for you. A little wipe and all traces of mascara are gone.